Easily the finest copy we've brokered in recent times and certainly outshines most VG copies in the hobby. 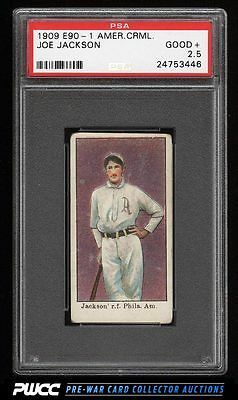 The E90-1 Jackson holds a special place in the hobby as its a rare example of what most people consider a true rookie card from Tobacco/Candy card era. Joe Jackson's history and lore has few piers; a highly romantic and yet tragic figure who loved the game and whose simplicity ultimately proved his downfall. Offered here is a stunning copy, void of surface issue or major creasing of any time. Even corner wear is all that prevents a higher grade with the print, color, and surfaces worthy of a much higher grade. Far superior to the grade assigned in many ways and comes with our highest recommendation. We love this card. One of nearly 20,000 cards, lots, and sets up for bid in our 7th Auction of 2016. Click on the link above to view the other PWCC auction lots.